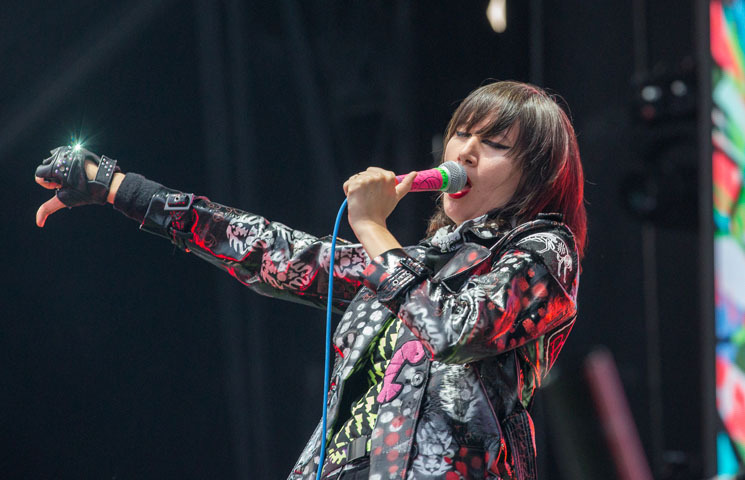 While most festival headliners rely on a barrage of lights and smoke machines to amplify their set, all the Yeah Yeah Yeahs have always, and will ever need, is the eminent Karen O. Taking to the stage with a single backdrop of their name written across an illustration of two white rabbits, Karen and company launched into "Y Control" with electric energy; Brian Chase stood up, crashing the symbols like it was the last song of their set, rather than their first. Wearing glittery pants with knee pads, and that had her name written above the bum in silvery letters, Karen O was all smiles, swinging the microphone and long chord around like a weapon. Wearing a trench coat with "Black Tongue" written across the back, the band moved, appropriately, into "Black Tongue" off 2003's Fever to Tell. Writhing, shaking and running across the stage, Karen was at her best. But she has always been at her best. Moving into "Sacrilege" off of 2013's Mosquito, followed by crowd favourites "Gold Lion," and "Zero," Karen then took a short interlude, running backstage for a leather jacket with her name, of course, written across the back as well. In the meantime, Nick Zinner took photos of the crowd on his camera, a gesture that was characteristically awkward yet endearing. Dedicating "Maps," their "great love song," to a plethora of people and things, from St. Vincent and Jenny Lewis to "someone you love more than life itself," Karen launched into the infamous song with the crowd rightfully singing along. After stepping down to the audience to get some help with words to following tracks, the Yeah Yeah Yeahs ended their set triumphantly with confetti floating over the rapt crowd.